Thank you for considering a gift to Johns Hopkins SAIS in support of our global educational institution that encompasses three campuses in Washington, DC, Europe, and Nanjing, China. 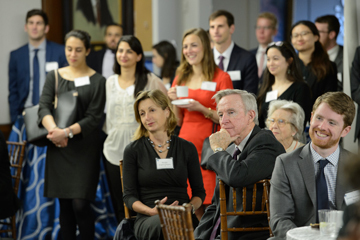 Alumni and friends have a tremendous impact on strengthening the mission of Johns Hopkins SAIS to educate tomorrow's leaders – individuals who are well positioned to excel in the international relations arena who will confront unprecedented challenges and exciting opportunities to serve. The school prepares innovative thinkers and problem-solvers with the economic, cultural and global expertise to operate across national boundaries and in complex international settings. We invite you to share our vision and support tomorrow's global leaders. Make a gift or pledge payment to Johns Hopkins SAIS by credit card online. If you would prefer to make a contribution by phone, please call 202.663.5630. Many companies sponsor matching gift programs that increase the impact of their employees' contributions by matching your gift dollar to dollar or perhaps even double- or triple-matching it. Find out what your employer's policy is and help your gift go further. Click here for details. If you are interested in making a gift of securities, please visit the Johns Hopkins Giving website at giving.jhu.edu/securities. You will be given complete instructions to ensure the efficient processing of your thoughtful contribution. If you have questions about making a gift of a securities, please contact Linda McGill in the Office of Gift Planning at 410.516.7954 or toll-free at 800.548.1268 or by email at legacygifts@jhu.edu. There are many ways to support SAIS in addition to outright gifts. Planned gifts allow Johns Hopkins SAIS to prepare for the future, and may result in significant tax benefits or even a new source of income for you and your spouse. For additional information, please visit the Johns Hopkins Office of Gift Planning website at giving.jhu.edu/giftplanning. Make an online donation in Euro or US Dollars directly to SAIS Europe by credit card (VISA, MasterCard, American Express and Discovery). From this site, you can select several Europe campus specific gift designations. To donate by mail, please fill out the contribution form and return it by mail to the SAIS Europe Office of Development, Via Andreatta 3, 40126 Bologna, Italy or by email. Tax deductible donations to SAIS Europe can be made from the following countries: Belgium, Canada, France, Germany, Ireland, Italy, The Netherlands, Poland, Switzerland, The U.K., The U.S. If your country is not on the list or for more information on how to give to SAIS Europe, please contact us via email. Thank you for your continued support of the Hopkins-Nanjing Center. Every gift you give makes a difference! Online: Please go online and designate The Hopkins-Nanjing Center under "Gift Designation"
Give a tribute donation in honor or memory of someone or to commemorate a special occasion using any methods mentioned above. Contribute with a gift of stocks or wire transfer. If a payment with securities is indeed made, please notify Emily Spencer. Explore planned giving options. Planned gifts allow the Hopkins-Nanjing Center to prepare for the future, and may result in significant tax benefits or even a new source of income for you and your spouse. For more information, please contact Emily Spencer. Alumni are actively engaged in their communities around the world. There are many ways for you to get involved today. Our three campuses stay connected with each other through Johns Hopkins SAIS-specific clubs and the Johns Hopkins University Alumni Association. Help us Increase Social Media Activity, especially using Twitter @SAISHopkins by using #SAISAlum and Instagram. Reach out to the alumni serving as the Primary Point of Contact (POC) in your region or become a POC by contacting saisalum@jhu.edu. Making a gift to Johns Hopkins SAIS can be instrumental in impacting the lives of our students, and is a great way to remain engaged. Please consider contacting the Development and Alumni Relations team at saisdevelopment@jhu.edu or (202) 663-5630 for more information on how you can make a difference through your gift. Talk about your career with a group of other professionals to give an overview of the field or to provide a deeper understanding of the diverse work within a particular organization. If you have an opportunity you would like to advertise to students, you can send the job posting with the description and contact information to sais.dc.careers@jhu.edu. We will quickly post the announcement and it will automatically be e-mailed to students who have indicated special interest in your employer or field. We can also collect résumé online from candidates who meet your needs and send them to you as a PDF résumé book. Come to the school's campus in person or virtually via video conferencing to tell students about where you work, explain the professional growth opportunities available through internships and job, as well as provide information on the application process. Come to our Fall or Spring Career Fair to meet students and talk about your employer and collect résumé from interested students and alumni. Please contact sais.dc.careers@jhu.edu if you would like to have access to Handshake. The Johns Hopkins SAIS experience is incomparable, made even more rewarding by the remarkable students we attract from around the globe. No one knows better than you what it takes to be successful at Johns Hopkins SAIS, and that is why we are asking each of you to spread the word by referring at least one exceptional person to the school. For a description of our degree offerings, click here. SAIS Alumni Relations captures the history of the school, alumni accomplishments and shared traditions by means of individual interviews, beginning with classes from 1945. Early SAIS graduates have great stories to tell. They remember a time when a professor might ask a class to opine on his draft of the North Atlantic Treaty. Arabic classes started at 5 a.m. And the CIA, a fledgling government agency, was hiring its first employees. 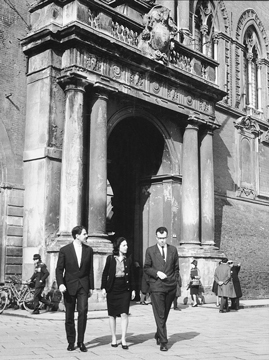 Several interviewees have shared memories of how they learned about SAIS as a brand-new graduate school and how they got accepted—including one alumnus who received a recommendation from ambassador to the United Nations, Illinois governor and presidential contender Adlai Stevenson. Alumni have recalled details of favorite classes and professors, landing jobs, meeting spouses and their other experiences as members of the post-World War II generation. Members of the SAIS community are encouraged to participate and to access the interviews. Click here to view a portion of one of our interviews with SAIS alumnus Ambassador George Lambrakis ’53. Jordi Izzard of the SAIS Office of Development and Alumni Relations is leading the program. To be interviewed, contact her at jizzard1@jhu.edu or 202.587.3210.